JPost reports that during Operation Cast Lead, Hamas converted medicine bottles that were provided by Israel as 'humanitarian aid' into grenades to throw at IDF troops (see photo at top left). 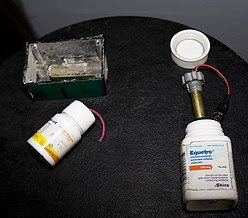 The medicine bottles were filled with explosives, holes were drilled in the caps, and fuses were installed. Once Hamas fighters lit the fuses, they had several seconds to throw the grenades at soldiers. The IDF also found small explosive devices that used medical syringes to hold their fuses. The medical grenades were discovered in northern Gaza by troops during last month's three-week battle against Hamas. The grenades were taken to military explosives experts, and then disassembled and studied. One bottle turned into a grenade originally contained a drug called Equetro, which is used by people who suffer from episodes associated with bipolar disorder. Another bottle had contained a vitamin supplement called Super-Vit. "This is another example of Hamas's cynical use of humanitarian supplies to attack Israel," a Defense Ministry official said Thursday. "Israel facilitates the transfer of the supplies to the Gaza Strip, and Hamas uses the supplies to create weapons." Well, you didn't think they were actually going to let the civilian population take their medication, did you? I'd bet they dumped the medications on the ground and didn't use them. Israel should supply the medications in foil packets like they do in hospitals and nursing homes. Or just not supply them at all. Hamas... just a bunch of humanitarians playing those Jews for freiers. Who says terrorism doesn't pay?